Woman described as Suspect 1 by Aspen police. 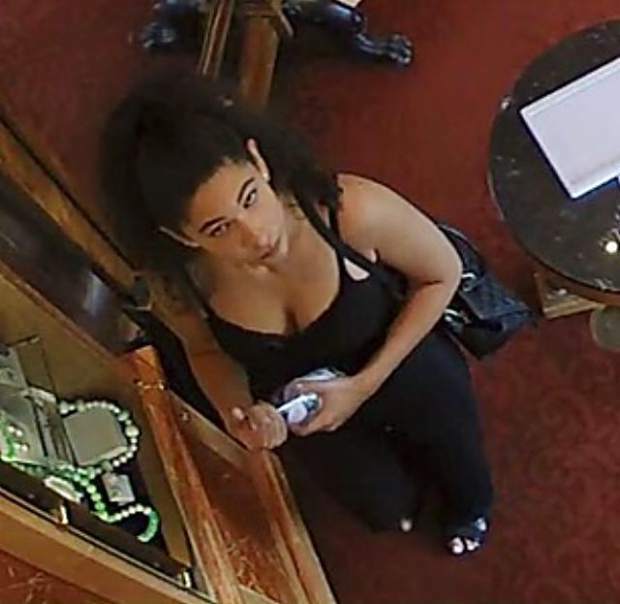 Aspen police released more information Friday on suspects from a jewelry store robbery earlier this week when five people stole nearly $95,000 in earrings and a pendant. Police think the five worked together to distract the one employee who was working Tuesday at Christopher Walling Jewelry on East Hopkins Avenue. Suspect one: Woman, in her 30s or 40s, 5 foot 5 inches tall with straight, long dark hair, olive complexion, wore a long skirt and carried a Michael Kors purse. Suspect two: Woman in her 30s or 40s, 5 foot 8 inches with dark brown hair in a loose bun, olive complexion, distinctive nose and wore a long skirt. Suspect three: heavyset woman with reddish brown hair in a top bun, wore a royal blue long-sleeved sweater with rhinestone buttons and a dark, ankle-length skirt. Suspect four: man in his late 50s, 5 foot 8 inches with unhealthy teeth, wore a short-sleeved white button-down shirt and white hat. Suspect five: woman in her late 50s, 5 foot 8 inches (while wearing wedge sandals), heavyset, missing some teeth and wore a visor low on her head. Officials released a more detailed timeline of how the robbery went down. The first two suspects went in to “case” the store at 2:50 p.m., asking about the price of some items, police said Friday. They left and the third suspect came in asking about the price of a pair of earrings, police said. During that time, the first two women returned and said they left their cellphone. Just after that, the fourth and fifth suspects came in and stole three items while the employee was talking to the first two women, according to police. The pieces stolen were a pendant ($45,240 value), aquamarine earrings ($21,750) and pearl earrings ($28,000). Anyone with information about the suspects is asked to call Aspen Police Detective Ritchie Zah at 970-920-5400.